Hammershus has now got a new visitor center (Brohuset ved Hammershus) and a new car park with payment parking. Below you can read the most common questions about parking at Hammershus. Parkering fees are in effect between the Saturday before Palm Sunday and the Danish autumn holiday (Danish: “efterårsferie” – week 42). Note: It is recommended to use the EasyPark app to pay for parking at Hammershus. This is the easiest solution, as there may be confusion about the operation of the parking meters. The app is available to IOS (iPhone) here or Android here. The area number of the car park, is written on the signs at the parking meter. Why is there payment parking at Hammershus? Revenue from the payment center goes to the Hammershus and the area around it. How can the Nature Agency be allowed to charge for parking? Is there a traffic warden at the place? Yes, several times a day. Who is responsible for the payment parking? You can make a complaint by contacting ParkZone, who is responsible for the payment parking. 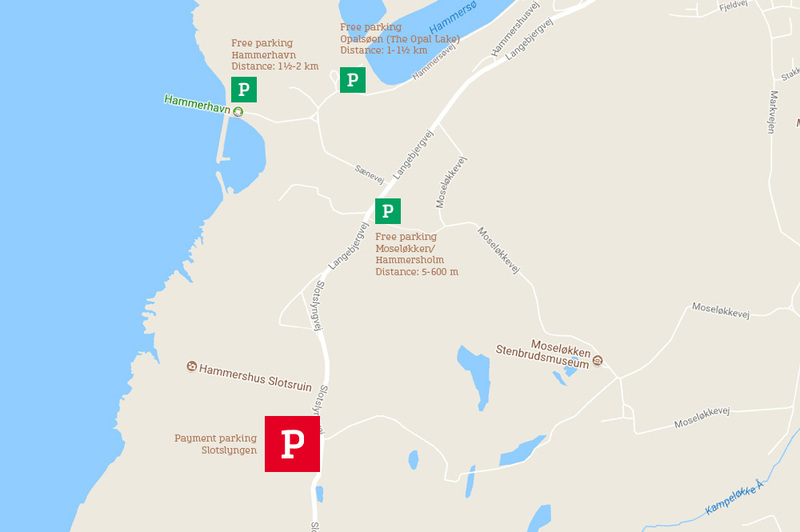 If you don’t mind walking a bit longer, then you can park for free at several parking places at Hammersholm / Moseløkken, on the Opal Lake and at Hammerhavn.